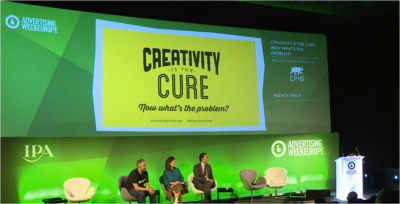 Nurture / The Startup Marketing blog / Tuesday’s AWEurope panel pick: Creativity is the cure. Now what’s the problem? Dave from CP+B kicked the discussion off saying that the new ways of working to use creativity, and making creativity very powerful, as well as very cultural, are key. You need people who care about the business that they are in, and how they can improve it with their own creativity. And that set the tone! The panel argued that creativity has become corrupt; with companies becoming more focused on things like awards which don’t really have anything to do with the business. As a result, this creativity has now become a commodity. We need to think more about how we are going to stand out from “ad-land” and not worry about what other people in the business are thinking, focus on how you connect with genuine audiences and create a culture. Heide then stepped into the spotlight saying that creativity is more craft than art, it takes a lot of hard work and a lot of iteration rather than just one eureka moment of inspiration. Focus is highly important in order to carry out your ideas right to the end. You need to know what your audience is passionate about, and what they are going to enjoy watching. Use their passion to fuel your creativity. Being brave is integral to all this; believe in your ideas and give them a try. A lot of people are stuck doing what they know; being afraid of trying new things and don’t want to take the risks. You need to be resilient and overcome all the challenges you are faced with along the way, don’t give up as soon as something doesn’t go to plan. Creativity is all about a huge commitment and perseverance to stick with your idea. Finally it was David’s turn from channel 4, there are so many creative tribes who all hold different skills and different ideas that you have to bring together in order to get that huge impact you want from your ideas. All different creatives work in very different ways; Journalists tend to have very little time to think – they have to produce articles and stories in under an hour sometimes. This means they have a very short attention span and have the ability to make very speedy decisions. On the other side, people in film and drama sometimes have over three years to think and create their ideas meaning they have a much larger amount of time to create and think it through. They key is to nurture talent when it is fresh, and do it at the right pace so that they are then ready when they have to face the big world and come up with huge ideas that could change a lot for a company. These guys only had time to scratch the surface here at AWEurope – but they sure did get the audience thinking!